Kurien R, Sudarsanam TD, Samantha S, Thomas K. Tuberculous Meningitis: A Comparison of Scoring Systems for Diagnosis. Oman Med J 2013 May; 28(3):163-166. Central nervous system (CNS) tuberculosis is one of the more serious manifestation of extra pulmonary TB constituting 6% of all TB cases.1 Among CNS tuberculosis, tuberculous meningitis (TBM) remains the most common presentation. In spite of advances in diagnostic technology and effective therapeutic options, it continues to pose significant management challenges. Despite anti-TB chemotherapy, 20-50% of the affected people die and many who survive have significant neurological deficits. The case fatality is noted to be associated significantly with delay in diagnosis, treatment and HIV infection. The poor sensitivity of cerebrospinal fluid (CSF) culture in diagnosis of pyogenic,2 and TBM is one of the major challenges in the diagnostic workup, hence many patients are treated empirically with antibiotics by care givers even before coming to a hospital leading to confusion with the entity "partially treated pyogenic meningitis". Two commonly used methods -Thwaites' system,3 and more recently, the Lancet consensus scoring system have been developed to improve the diagnostic accuracy.4 The scoring systems include clinical features, CSF findings, as well as neurological imaging in making a diagnosis. Our medical unit diagnosis of TBM is made on a combination of clinical features and CSF findings (largely based on the Thwaites criteria), though finally decided by the treating consultant. CT and MRI tests were used only when there was suspected neurological defecit. We did not use any algorithm. The present study evaluates the profile of patients with a diagnosis of CNS infections attending a tertiary care centre in India with a focus on TBM and compares the diagnosis made by the treating team with that of the Thwaites and the Lancet scoring systems. Patients admitted under one medical unit of a tertiary level university teaching hospital with approximately 40,000 outpatients (OP) and 2000 inpatients (IP) per year were eligible for inclusion. The hospital has excellent medical records, and all information is stored electronically and coded according to International Classification of Diseases (ICD) 9 system of coding. The study data was collected for a period of 5 years (2006-2010) from IP charts of the medical unit. All patients who had readmission and did not have a diagnosis of CNS infection were included. Data analysis of continuous variables was described using means with standard deviations and categorical variables were summarized using frequencies and percentages. Association between categorical variables was assessed using Chi-square test and comparison of means was done using independent two sample t-test. Patients with an MRS between 0-2 were catigorized as good outcomes and the 3-6 as poor outcomes. We evaluated whether there was any difference in outcomes based on the three scoring methods (i.e., the medical units’ diagnosis, the Thwaites score and the Lancet score). The differences in the discordant results between systems were analyzed using chi-square statistics. Epidata 3.4.11 was used for entry and all statistical analysis was done using Statistical Package for Social Sciences (SPSS) software (version 16, SPSS, Inc, Chicago, IL, USA). The study was approved by the institution of research board, study No: IRB (EC) - ER-4-24-08-2011. During the 5 year study period (2006-2010), 9892 patients were admitted under the medical unit. Of these, 338 IP records were identified using the search strategy as having CNS infections. Among these, 32 were either readmissions or were not CNS infections and were excluded based on inclusion/exclusion criteria, leaving 306 cases with a diagnosis of CNS infection, which were included in the analysis. As expected, only 29 of 234 (11%) cases for which mycobacterial cultures were sent grew had M. tuberculosis, all of whom were diagnosed as TB by all 3 methods. Among the 306 patients, the final diagnosis of the treating physician was TBM in 84.6% (260/306), acute CNS infections in 9.5% (29/306), pyogenic meningitis in 4.2% (13/306) and aseptic meningitis in 1.3% (4/306). The age varied from 15 to 83 years with a mean of 37.3 (SD: 16.2). There were 192 (62.7%) males and 114 (37.3%) females. Of these, 11.8% (36/306) died and 33.3% (102/306) had significant residual neurological problems at discharge as evidenced by an MRS of 3-6. Among these 306 patients, 284 (92.8%) were classified as "TBM" by the Thwaites’ score and the rest as "Pyogenic". While the Lancet classified 29 cases (9.5%) as "Definite-TBM", 43 cases (14.1%) as "Probable-TBM", 186 cases (60.8%) as "Possible-TBM" and 48 cases (15.7%) as "Non TBM". Table 1 compares the unit’s clinical diagnosis with the classification of the same patients by the Thwaites’ score. There was moderate agreement between the unit diagnosis and Thwaites classification (kappa 0.53). 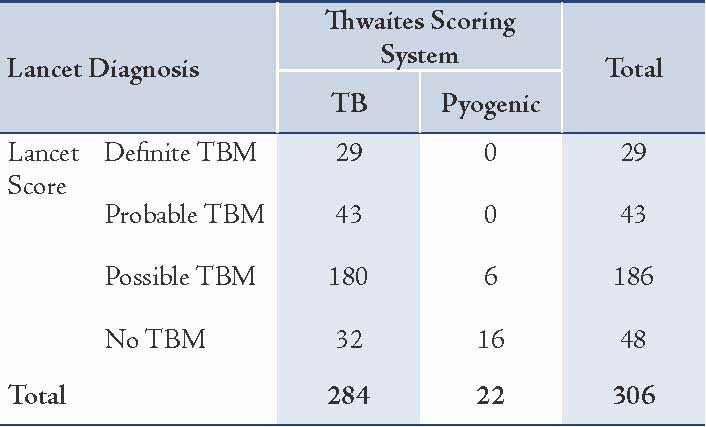 It was noted that 32/284 (11.3%) cases classified as "TBM" by Thwaites’ score were not diagnosed as "TBM" by the unit and 8/260 (3%) patients diagnosed as TBM by the Unit were not classified as TBM by the Thwaites score. A comparison of the unit’s clinical diagnosis with the classification of the same patients by the Lancet score is seen in Table 2. Only a moderate agreement was observed between the two methods in diagnosing TBM. Namely only 17 /186 (9%) cases diagnosed as "Non TBM" by the unit were classified as "Possible TBM" by the Lancet score, and 18/260 (7%) cases diagnosed as "TBM" by the unit were classified as "Non TBM" by the Lancet score. The comparison of the two scoring systems is given in Table 3, which indicates that there is reasonably good agreement between the scores. It was also noted that 32/ 284 (11%) patients who were classified as TBM by the Thwaites' system were classified as "Non TBM" by the Lancet score and 6/258 (2%) of those who were diagnosed as possible, probable or definite TB were classified as Non TB by Thwaites' score. All of the six patients were under possible TB category. Table 4 highlights the reasons for the difference in classification. The results of the cranial nerve palsy and abnormal CT scan results contribute towards the difference between the scores. Some variables such as the presence of TB elsewhere appear more in those with concordant results, but do not pose any statistical significance. Table 1: Comparison of the Medical unit’s diagnosis vs. the Thwaites score classification. 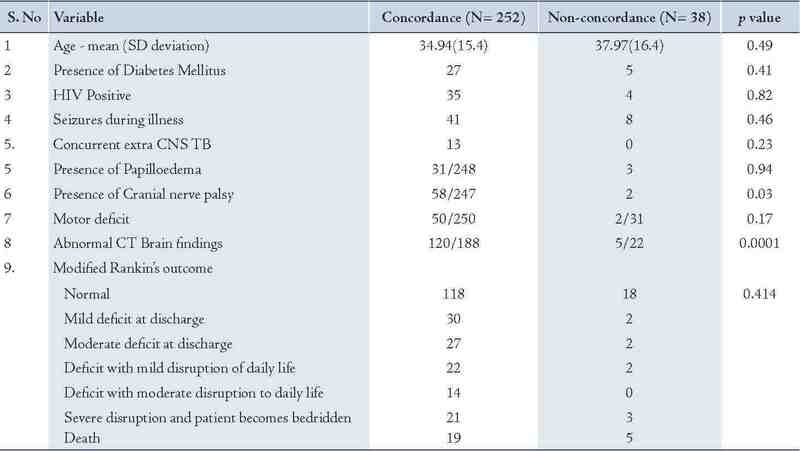 Table 2: Comparison of the Medical unit’s diagnosis vs. the Lancet score classification. 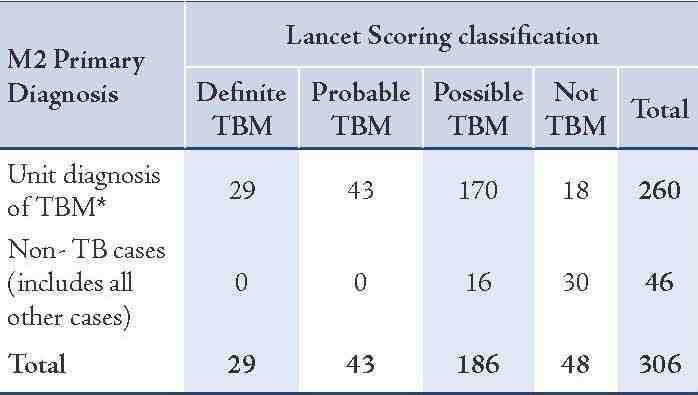 Table 3: Comparison of the Thwaites score vs. the Lancet score classification for the patients. Table 4: Comparison of the patients’ characteristics in those with concordance and discordance of the Thwaites and Lancet consensus scores. The following limitations of the study need to be highlighted. The scores were done on patients who had a final diagnosis of CNS infections and so their sensitivity and specificity may be higher than if done on patients with suspected CNS disease. Also, follow-up data was not available which would have been invaluable to compare the validity of different scoring systems more optimally. The lack of CSF serology and virology data on all studied patients limited our ability to assess how many could have been partially treated as pyogenic meningitis or viral infections. This study demonstrates that the widely used Thwaites' score compares well with the more detailed and resource intensive Lancet consensus score. We also found that outcomes for patients who had discordant results between these scores were not different from those who had concordant results when treatment was initiated based on expert clinical evaluation in a tertiary care setting. However, prospective evaluation of cost-effectiveness of simple but more effective and rapid diagnostic tests are needed in the primary care setting where imaging facilities are lacking. We acknowledge the microbiology department for their untiring work and 24 hour service for the diagnosis of TBM. Medical records department of the Christian Medical College for their diligent work that makes such studies possible. No conflicts of interest to disclose and no funding was received for this work. 2. Ahmed R, Thomas V, Qasim S; Thomas V; Qasim S. Cerebro spinal fluid analysis in childhood bacterial meningitis. Oman Med J 2008 Jan;23(1):32-33. 3. Thwaites GE, Chau TT, Stepniewska K, Phu NH, Chuong LV, Sinh DX, et al. Diagnosis of adult tuberculous meningitis by use of clinical and laboratory features. Lancet 2002 Oct;360(9342):1287-1292. 4. Marais S, Thwaites G, Schoeman JF, Török ME, Misra UK, Prasad K, et al. Tuberculous meningitis: a uniform case definition for use in clinical research. Lancet Infect Dis 2010 Nov;10(11):803-812. 5. Kennedy DH, Fallon RJ. Tuberculous meningitis. JAMA 1979 Jan;241(3):264-268. 6. van Swieten JC, Koudstaal PJ, Visser MC, Schouten HJ, van Gijn J. Interobserver agreement for the assessment of handicap in stroke patients. Stroke 1988 May;19(5):604-607. 7. Török ME, Nguyen DB, Tran TH, Nguyen TB, Thwaites GE, Hoang TQ, et al. Dexamethasone and long-term outcome of tuberculous meningitis in Vietnamese adults and adolescents. PLoS One 2011;6(12):e27821. 8. Pehlivanoglu F, Yasar KK, Sengoz G. Prognostic factors of neurological sequel in adult patients with tuberculous meningitis. Neurosciences (Riyadh) 2010 Oct;15(4):262-267. 9. George EL, Iype T, Cherian A, Chandy S, Kumar A, Balakrishnan A, et al. Predictors of mortality in patients with meningeal tuberculosis. Neurol India 2012 Jan-Feb;60(1):18-22. 10. Kalita J, Prasad S, Maurya PK, Kumar S, Misra UK. MR angiography in tuberculous meningitis. Acta Radiol 2012 Apr;53(3):324-329.